Mothers Against Senseless Killings is setting up posts in the New York boroughs of Brooklyn and Staten Island. 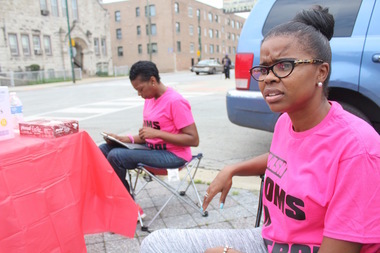 CHICAGO — The Mothers Against Senseless Killings group, or the 'Army of Moms' as they are sometimes called, will soon have posts in New York City. The group's founder, Tamar Manasseh, will travel to Brooklyn and Staten Island Wednesday and Thursday. She said the people there "feel like we've found a cure" to the violence. "We were called to go," Manasseh said. "They have had their own share of problems. Every city is different. Chicago’s violence doesn’t necessarily look like New York’s, but as long as the people there understand it, and they understand the model and the way we go about doing things, they’ll be able to take care of it." Tanisha Smith Franks lives in Staten Island, and the mother of three daughters and is excited to bring the group to her neighborhood. "A lot of women have expressed interest to do something similar, so I just kept an eye on what they were doing in Chicago and decided to start [a chapter of the group] out here," she said. The founder of a similar initiative by a group of men called Occupy the Block reached out to Manasseh and connected her with Smith Franks. The violence isn't on the same level as Chicago, but she said the Army of Moms model could still work. "Our hearts are so with Chicago and all the things that are happening there," Smith Franks said. "We have scattered instances here and there," like a stabbing, a murder and some shootings. Her chapter's approach will be a little different from Chicago's, though, she said. The objective is to really engage with the children and teens, Smith Franks said. She and other members will put together a list of all the local activities and programs for young people, especially the free ones. "We want to match people with things that already exist," she said, adding that she will work with elected officials to create the programs that don't exist. "We want to find out what they really need and match them to the organizations and activities that could develop character and self-worth. It's also about addressing some of the things that lead to street violence." The other goal is to get the young mothers involved in activism. "I would really like to see the young moms out here reclaiming their community," Smith Franks said. "I’m excited. I’m hopeful that people will come out, but I’m more looking for committed people." She'll be meeting with about 20 women from 7-9 p.m. Wednesday at the Canvas Institute, 150 Victory Blvd., in Staten Island. Manasseh is their special guest and will share her experience. Manasseh has since moved from the block where it all began. The group formed in June after the slaying of 34-year-old Lucille Barnes in the 7500 block of South Stewart. The goal was to stop any retaliatory violence. "They don’t need us anymore. They have their own chapter, their own post. They have their own leader, they don’t need us. That’s what it’s about, it’s about building posts everywhere we go." And here in Chicago, all next week, the mothers and volunteers will be in seven communities, including Uptown and Humboldt Park.